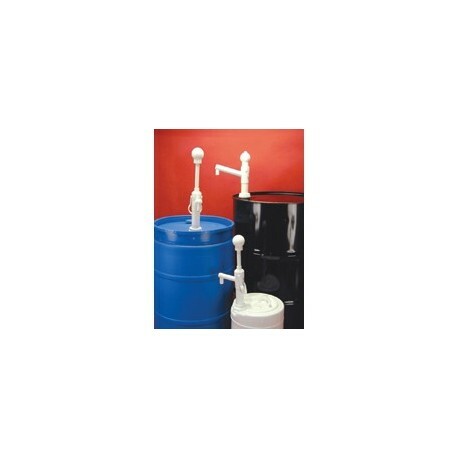 The E-Z ACTION 5 GALLON HAND PUMP is ruggedly constructed of polypropylene and polyethylene. The E-Z Action pump does not rely on standard 'piston-pump' principles, allowing minimal friction whilst pumping, and dispensing during 'up and down' stroke. With only 2 moving parts, the patented zero-friction design provides effortless flow of thin or thick liquids up to 8,800 cPs. Recommended uses include acids, alkalies, oils, caustics, water, hand soap and many other liquids. Not for use with flammables or solvents. • Approximately 180ml (6oz.) ouput per stroke (up/down).